My sister asked me the other night if I had a good recipe for roasted chickpeas. Though I had been seeing them all over the internet (here, here and here), I had yet to try them at home. In thinking up a recipe for my work lunches this week, I decided to try a rather simple salad and top it with crispy tasty chickpeas. In further reading Whole-Grain Mornings, I decided to try my luck with wheat berries - a nutty, chewy wheat kernel that is hearty and satisfying. Start by cooking the wheatberries. Combine the wheatberries with 3 1/2 cups of water in a pot. Bring to a roaring boil, then reduce the heat, cover, and simmer for 1 hour. Drain and set aside. Place the rinsed chickpeas on a piece of paper towel and dab dry. Transfer them to a medium size bowl and add the oil, spices and salt. Stir to combine. Spread the chickpeas onto a parchment lined baking sheet and bake for 30-40 minutes, stirring every 10 minutes. Combine the chopped kale, carrots, olive oil, salt and pepper in a bowl. Using your hands, massage through. Set aside. When the wheatberries are ready, add them to kale slaw. In a small glass jar, make the dressing by combining the lemon juice, dijon and olive oil. Dress the salad. When ready to serve, divide the grains into 4 bowls. 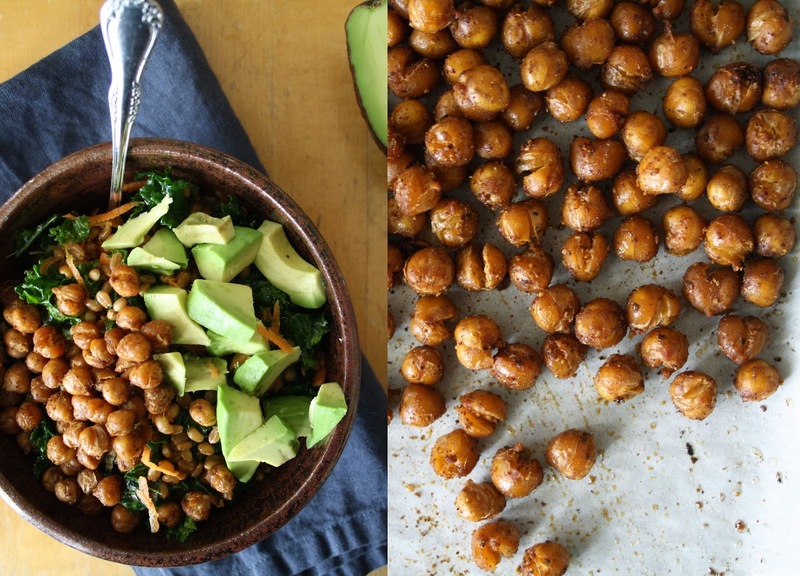 Top with a heaping spoon of chickpeas and some diced avocado.